The first native 1:1 macro lens for the X-system. This is an impressively sharp lens with a very well working optical stabilizer. The AF is quick, even in the macro range, and does not hunt much. First powerzoom lens for Fujifilm X-Mount cameras. New version, bundled with the new Fujifilm X-A2. Better build quality, closer minimum focus distance. Manual focus short tele lens. A set of real Cine Primes, all with similar body design and size. The Veydra lineup consists of seven lenses, 12, 16,19, 25, 35, 50 and 85mm in focal length, but only 19mm and up cover the super35 format and are available for Fujifilms X-Mount. Fixed aperture, fixed focus body cap lens. "Sharp" from approximately 1 m to infinity. So far only available in Japan. Mirror tele lens, similar to those sold by Samyang. Ring-shaped out of focus highlights, not very sharp. 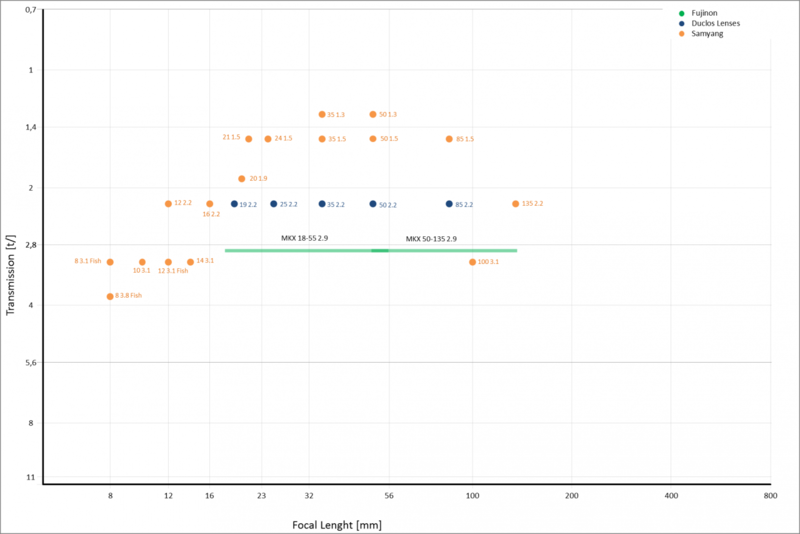 An update to the fastest lens for the Fuji X-Mount. Supposed to be better corrected optically. Manual wide angle prime lens. Manual medium wide angle prime lens. Manual medium telephoto prime lens. "Swirly Bokeh" lens with second aperture to control strenght of swirl effect and vignetting. Selective focus lens (extremely curved field of focus). By tilting the lens, you move the "focus point" across the frame, which will be the only part of the picture that is sharp, while everything else gets blurred. Has additional aperture blades in front of the lens to shape the out of focus rendering. Like the shorter Velvet 56, this is a soft focus lens. New version of the composer pro tilt adapter. It has a metal body and tilts 15° in every direction. A circular fisheye lens with an angle of view of 160°. It throws a circular image onto the sensor plane of a full frame or APS-C camera, the rest of the image is black. The internal barrel is polished to create a ring of flare and reflection outside the image circle. Selective focus lens (extremely curved field of focus). By tilting the adapter, you move the "focus point" across the frame, which will be the only part of the picture that is sharp, while everything else gets blurred. Soft focus lens with drop in aperture discs in three aperture sizes. Instead of soft aperture discs, this lens has 12 discs with different shaped aperture openings and a curved field of focus to generate a "focus spot". Selective focus lens (flat field of focus). By tilting the adapter, you generate a "focus slice" across the frame, which will be the only part of the picture that is sharp, while everything else gets blurred. When the lens is not tilted, it works like a usual lens. This lens creates a swirly bokeh, known from petzval lenses. Lensbaby recommends to use this optic on full frame cameras, because crop cameras will cut away most of the swirly bokeh. Fisheye lens with an angle of view of 160°, made for full frame dslr cameras. Looks similar to the old Samyang 8/3.5. Manual Focus wide-angle lens. Looks suspiciously similar to the Samyang 12/2, but has a slower aperture. The fastest wide-angle lens for the X-Mount. A pancake sized manual focus normal lens for mirrorless APS-C systems. Small manual focus normal lens for mirrorless APS-C systems. Reviews say it's not very sharp. Small manual focus short telephoto lens for mirrorless APS-C systems. The Meike-branded version is labelled f/2.0, while the similar looking Kaxinda-branded version is labelled f/2.4. Very cheap manual medium-wide-angle prime lens. Very cheap manual medium-wide-angle prime lens. Aperture and focus ring are reversed compared to the "Zonlai" branded lenses. Package includes a reverse mount adapter that can be used for macro photography. A fast manual focus normal lens, designed for mirrorless cameras. Small manual focus medium-wide-angle prime lens. Small manual focus normal prime lens. For a bit more money, the Fujinon XF 35mm F2.0 R WR and the Fujinon XF 35mm F1.4 R offer autofocus. Very fast manual focus short telephoto prime lens, very expensive. Currently the highest magnifying macro lens for the Fuji X-Mount. As the name implies, a 180° fisheye lens, which throws a circular image onto the sensor plane. An inverted wide-angle design creates a pure macro lens with magnifications between 4 and 4.5. Can therefore not focus to infinity. The lenses' maximum aperture plottet over their focal length and the resulting diagonal angle of view. The scale is double logarithmic. Please note that the denoted angle of view is only valid for rectilinear lenses, fisheye lenses have a wider angle of view at the same focal length, which is inherent to their design. The lenses' transmittivity plottet over their focal length. very nice, I particularly appreciated the factual part of the list while I have some reservations on the “ comments” some of which are clearly based on hearsay or a debatable opinion ( there are other opinions out there opposed to the quoted ones). I own the 56 APD, and as you comment, it's a nice one to have just for the uniqueness. I don't miss the loss of light at all, but the bokeh is stupendous. If I could only have one lens, this would be it. I've seen some go second hand for same price as a new normal 56, so well worth a shot. Mine did have to be serviced twice though, first the autofocus motor died, then optical assembly was horribly unsharp. Now it's crazy sharp, so watch out when you get a second hand one without testing it. One thing strikes me and I have been thinking about this for a while. I read many comments about faulty fuji lenses ( i suppose that other brands have that kind of problem too, I don’t partake to other sites ), yet the Fuji lens assembly looks first class. I wonder if we just know more about problems due to internet exposing these things or if standards have fallen because from the ’70 to the late ’90 I don’t remember having ever heard of so many problems. if standards have fallen because from the ’70 to the late ’90 I don’t remember having ever heard of so many problems. How many AF lenses you had in the 70s? How many rolls of film that was capable of producing 300+ frames you had in the late 90s? From the second half of the '80 onwards there were many AF cameras and electric lenses and yes we shot less but there were many more cameras around that there are now and it seems to me that there were less complaints, but I can’t say for sure. You hear more about problems than about succes stories. In other words: Look at the local news... it's filled with "disasters, crime, traffic jams, etc." but hardly with positive news. Very nice work - a fine reference for the community. Thank you! ....I don’t remember having ever heard of so many problems. No internet back then. No electronics in what were solid brass (or aluminum) and glass lenses. Film did not show lens flaws like a 36mp digital sensor. But mostly the first thing. I understand the lack of internet and in fact I did mention that that was a possible factor in determining my perception but I was into quite a network of pro-photographers and worked at trade fairs ( with tens of thousands of visitors) for both Pentax and Nikon and yet never heard too many complaints. This weekend, I took some time to sit down and think about the future of my Fuji system. Looking through my highest rated shots, I realized that some things I try to shoot just don’t work out the way I’d like, and don’t show up with the 4- or 5-star pics. While I’m perfectly happy with every single piece of my current kit* when used for the intended purpose, it seems that I probably need a new lens or two. *Short explanation: Wanted to buy just the X-T1 and the XF 55-200, and a fast prime later on. Ended up buying the X-T1 + XF 18-55 kit as a demo sample in a shop for a price less than a new body alone, which prevented me from buying a fast prime so far. The XF 18-55 does just everything except extreme bokeh. But for bokeh, I can use the incredible 55-200. As you can see, I’m not completely sure about every lens. But perhaps that’s where you can help. I’ve also made a chart, plotting the lenses’ maximum aperture over the focal length. The focal length scale is logarithmic to show the prime area more prominent. The aperture scale is now logarithmic too, to provide equal intervals between full aperture stops. I’m not sure if the aperture curves for the zoom lenses are correct. However, I had a look at what aperture my own two zoom lenses have depending on the focal length, and fitted a formula to compute the aperture curve. I then used that formula for the other lenses too. When comparing your own lenses, consider that the aperture shown on your camera is a rounded value, and probably jumps to the higher value before really reaching it when increasing the focal length, and vice versa for decreasing the focal length. - some cosmetic changes, spaces etc. Thank you all for the positive reception! Does anyone know if and how the width of the graphic can be adjusted automatically? I have some reservations on the “ comments” some of which are clearly based on hearsay or a debatable opinion ( there are other opinions out there opposed to the quoted ones). I know, and I've never tried to hide that fact. The comments are exactly the part I'd like to improve on the most. Just tell me what you don't like and why. Can't hurt my feelings, I'm an engineer. Didn't expect that, would make me happy. But are you sure it's already good enough to be shared? As stated previously, there's a lot to be improved. Thanks, added to the OP. @Tom H.: Thanks, input appreciated very much! I'm no magician, I'm afraid. And I'd like to know more too. But I'll have that lens the day it is available, if it's bright enough (5.6) at the long end. Don't care about the short end, and would prefer a fixed aperture lens, for the marked aperture ring. About the Film debate, I think I can contribute to that one. short background info: I started shooting film when I was about 8 years old (cheap rangefinder -> Canon AE-1 Program -> Canon T70) and did so until the late teenage years, when digital was already wide available. Went on to digital point an shoot out of convenience (Panasonic TZ-3, Sony RX100), and am now back to bigger cameras with the X-T1. Quite a long time, most lenses were manual. I myself do not own a single AF-lens for my film cameras. The manual lenses, without any electronic parts, have proven to be nearly indestructible due to their simple mechanical design, as Max_Elmar pointed out. The AF-lenses for the Canon FD mout were hideous giant bulky beasts with the AF-stuff growing out of the side. After Canon finally switched to the EOS system with the EF mount in '87, I remember some negativity relating to the reliability of the lenses, but not much. On the Nikon side, I've never heard anything bad. Perhaps because the lenses were still mostly pure mechanical designs, with the AF motor in the camera body. So I guess there were less problems in the film era. But on the other side, I really think that most problems that are easy identifiable today would have gone unnoticed in the film era. The common user would not shoot 30 pictures of the same thing, and thus would not see that the lens is, for example, decentered/tilted. And even if the defect would theoretically be there on every picture, you probably would not have seen it because of the way we looked at our analog pictures at that time. Projectors and (silver) screens gave huge pictures to look at, but none of those I have seen were anything close to what we would call "sharp" today. And the standard size prints would not have revealed most of those problems, too. Today, everyone can look 1:1 into those 24 MP files on 27" 2K or 4K screens, and right away share his/her findings with the whole world..
Oh, and by the way, I'm no native english speaker, and I've never liked languages that much, so please pardon my inevitable orthographic and grammatical mistakes. To me this is a very good work already. But if you need time to perfect it, it's absolutely fine to wait. You are using Firefox, right? Well, where you comment on the 12mm Samyang being not sharp at the edges at full aperture you are openly reporting someone else’s opinion and not your own findings and that opinion is not even a common one among the many users and reviewers of this lens. However you don’t mention that the Zeiss 12mm has very similar resolution under the same circumstances but you correctly identify that it has the advantage of autofocus but at an incredible price for this against a similar performance. Another thing that you mention is that the 50-230mm due to its aperture would be a full sunshine only lens. Granted it is not the most light efficient lens but given the fact that I have shot great shots with Fuji cameras up to 3200 ISO , this lens is perfectly capable to go into relative darkness and in any case at only a very minor disadvantage compared to the way more expensive 55-200. In a thread that I have opened on this lens many report having been discouraged from buying it from comments like yours, while the many USERS of this lens show more than decent shots. I don’t use long focal lenses much and that’s why I bought this lens but I have been marveling at its quality ever since. In fact I am now selling mine to a friend and buying another ( in a kit where this lens practically comes for free!). The 60mm macro shows a 1:2 reproduction ratio, this was not at all uncommon for many macro lenses in the film days and they came with rings to expand to 1:1 or more. Exactly like the 60mm does. The second lens that I bought was a 10-24 mm at the time one of the most expensive lenses in the system. It came out from a never opened package with some black spec inside the lens sitting on the inside of the first rear element plus a few more smaller bits inside only visible with a magnifier. I was horrified and I went back to the shop and they gave me another one, no problem, but I have heard of so many of these stories afterwards that this was by no means a freak occurrence ( also about Samyang) and that includes also lenses (especially wideangles) with misalignment of some element showing a definite loss of sharpness on one side only of the frame. This I find particularly disturbing. Especially when it comes to buying a secondhand lens or one ordered overseas! Yet the video of the Fuji assembly line shows a spotless and very high quality ( the Samyang assembly line is nowhere near that perfect) operation. If that is the case specs in a new lens can only come from parts inside the lens wearing out after they have assembled it and they test the lenses ( but don’t look into them before putting into the box?). In the olden days ( even when lenses were already autofocus and had electric and electronic parts) I can’t remember hearing so many complaints. I understand that the internet makes this information more readily available but, as I said before, at that time I worked as a camera demonstrator and even as chief demonstrator, managing an entire crew of demonstrators, at trade fairs for Pentax and Nikon. I’ve heard all sorts of complaints and suggestions ( those drove me crazy, now we read them on line, people living in a fantasy world thinking that a lens which has been studied and developed of several years before finding production could be tweaked if only I communicated to Mr. Nikon or Mr. Pentax their wishes!) but never of the nature that I am reading, for example here on this forum. If not, please empty your cache. In the history of forums anywhere. Has anyone ever had a post #1 established as a sticky ? Quite a few times yes, Internet is filled with wise and knowledable ppl too. I have the Samyang 85mm 1.4. It is a decent quality lens specially for it's price. It's obviously made for portrait and it works good IF you like the soft look. This is not an ultra sharp lens. But for specifically getting soft results, it is quite good. I don't regret buying it, cause i know there are situations i really like to use it, but to be honest it's use is quite limited. Now that the 90mm F2 fuji lens is out, i would not buy it, cause i get the soft results in post production if i really want to, and i'd have the sharpness that the samyang 85 simply can't get. First: I hit some kind of barrier while searching for more information. Does anyone know more about the magnification of the samyang lenses? I could easily calculate (idealized) the magnification from the close focus distance and the focal lenght, but the problem with this is, that the results will probably be quite off because of the focus breathing most lenses have. I will soon proceed to add more one to two sentence - conclusions to several lenses, as soon as I myself am sure about what to think about them. Most will of course be based on the consensus of reviews found across the internet. My long term goal will be to add two or three links per lens to reviews I think are informative and fair. Is there anything (forum rules, personal aversion) that speaks against that? I feel honoured about that. Feel free to share this thread whenever you want, if you still want to. Perhaps, if more people see the thread, more people contribute to the collection of data. Right, it's the Firefox. Whatever you did, it worked. Thank you very much! I supposed it would be this one and the 50-230 where we collide. But one after the other. I guess what I wrote about this lens looks a bit confusing. What I was trying to say was, everything I have read about this lens was very positive, except that one example. And I wanted to link that one example, so everyone can draw own conclusions. Actually, the Samyang 12mm 2.0 is one of the few lenses I strongly consider to buy in the near future (for landscape, astro stuff and cramped interiors), so I already hold it in high esteem. I will rephrase the comment on that lens in the near future. And let us be fair, regarding reporting someone else's opinion: I never said "I tested each lens available for the X-Mount and this is what I found out", I said I made a list because I want to expand my lens collection. So, most of the comments I write will be based on reviews. While I think we do agree on the Samyang 12 2.0, this one will get difficult. Unlike you, most stuff i shoot is at the long end. To be precise, about 70% of my keepers are shot with the XF55-200, and a bit more than 75% of those are shot at 200mm. Thus, I'm a bit more critical about that lens. I have never critcised the image quality of the 50-230. All I have seen was acceptable, and the lens is for sure great for people who don't use long focal lenghts often. The price is a steal. But the 55-200 is not that much more expensive, especially with the 50-140 in mind. Anyway, the aperture is where we probably will not be able to agree. Even if we say we compare them both at 200mm, because the 55-200 can't go to 230, the 50-230 is at that focal lenght at approximately f/6.5. That's one stop less light, which means doubling the ISO. Since I frequently have situations where I already need to go to ISO 1000 or 1250 with the 55-200, the 50-230 would need to go way beyond ISO 1600, where I've set my personal limit. Above that, the image quality just degrades too much for me, especially if you need to crop. You can't see detail in the hair/fur/feathers of wildlife, and for eyes it's often too much grain to really "pop". Getting the ISO down by using a lower shutter speed (below 1/300th - 1/500th) and relying upon the OIS does not work with moving subjects. All in all, the 50-230 just is not for me. And that is not because it's "only a XC lens", but because it does not what I needed it to do. And the 55-200 does. I guess "sunshine only lens" is a bit harsh, and it depends on what one uses the lens for. but if you want shutter speeds faster than 1/300th closer to 1/500th, an aperture of 4.8 will get you to high ISOs long before sunset. And 6.7 doubles that ISO. I didn't say - and never wanted to imply - that this lens is anything but good (optically). But focal lenghts below 180mm (35mm equivalent) are simply not useful for what I want to do. If someone take pictures of flowers, does product photography or anything else where the subject does not try to run away when you get too close, this lens might be all one ever needs. And for most use cases, 1:2 is enough. But not for me, and that's why I hardly can wait until the XF 120mm Macro gets released (or until I can try to screw a giant achromatic closeup lens onto the 100-400). I guess I need to rephrase that one too. Sorry to hear about your 10-24. As long as we can quickly get working replacement for the flawed lenses, I guess it's acceptable. And overall, the lens quality is what made Fujifilm so successful in only a few years. But perhaps the high demand was too much for their production line, and when they needed to speed up production, somehow the QA was left behind? Thank you very much for your input! Just a question before I add that to the OP: Is the lens always soft, or does it get sharp when stopped down? And if it gets sharp, at what aperture? The comparison with the XF 90mm 2.0 suggests itself because of the quite similar size, weight and focal lenght, but the one whole stop brighter aperture (Samyang) could make a difference, as well as the autofocus (Fujinon). And while the Samyang is a lot cheaper, the XF 90mm 2.0 seems to be optically superior. So I guess, both lenses might have their audience within the X-System. Perhaps, if more people see the thread, more people contribute to the collection of data. thanks for the clarifications but again, many of your statements are, as you yourself say, based on you particular needs ( the frequent use of “ for me” in your explanation shows that you are aware of that) that is therefore not an universally applicable criterium, or your likes and dislikes, often times not based on direct experience but on someone else’s report. This is what these days is often found on the internet articles quoting other articles which often are based on other articles. Nothing wrong with that as long as one clearly says that what you are quoting is someone else’s opinion which you might very well share, but that you have no direct experience on. The list you made, commendable and useful though it is, might arise in some readers the idea that it was all based on factual, objective and direct experience collected by you personally and that, isn’t always the case.